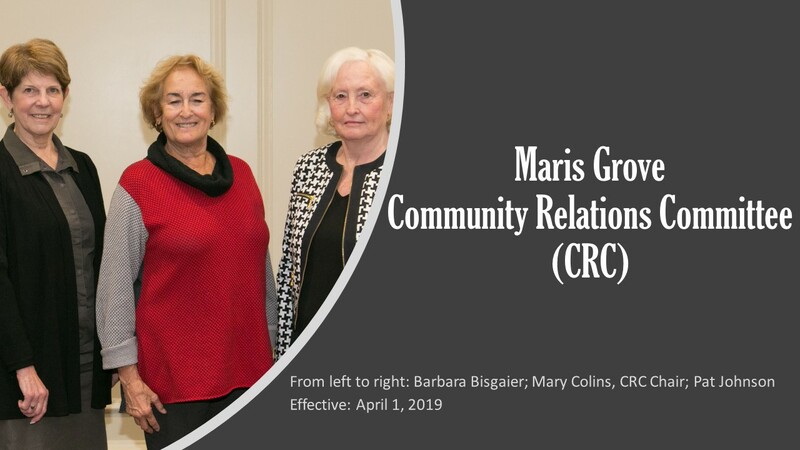 Ms. Bisgaier, chair of the Ann’s Choice Community Relations Committee (CRC), a member of the Maris Grove CRC and community Boards, retired from her position as Managing Director of Public Financial Management, Inc. with more than 40 years of experience in local government and public finance. She is a member of the Board of Directors of National Senior Campuses and serves as chair of the NSC Audit Committee and as vice chair of the NSC Budget and Finance Committee. She also serves on the Board of Directors of WHYY, Philadelphia’s public radio and television stations where she is a member of the Executive Committee, chair of the Governance Committee and a member of the Finance Committee. Ms. Bisgaier is a graduate of Mount Holyoke College and received a master of city and regional planning degree from Rutgers University. Ms. Johnson is the Director Living in Community for Maris Grove and is a member of the NSC’s Communications Advisory Committee. She is recently retired as the CEO & President of a national non-profit agency (Associated Services for the Blind and Visually Impaired). During her tenure, she provided valuable services to over 800,000 people who are blind or severely visually impaired while significantly increasing the endowment fund. Ms. Johnson also managed a high rise building in Center City Philadelphia, as well as served as a lobbyist. She has worked on the Corporate Staff at CIGNA in various senior level executive positions. Earlier, served as the Director of the Parks and Recreation Department for New Castle County, DE. Ms. Johnson has extensive knowledge in long range strategic planning, financial oversight, people management, relationship marketing, and has served on multiple Boards. Her MBA is from The Wharton School with an undergraduate degree from the University of Delaware.